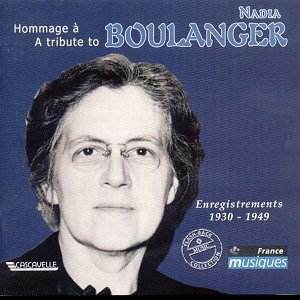 Many will be familiar with Nadia Boulanger�s 1937 selection of Monteverdi Madrigals, a seminal recorded set, and one that has been in and out of the reissue catalogues since the 1970s. The Boulanger-Lipatti recordings have also garnered reissue status, more so in fact than the Madrigals. I suspect however that the Petit Concert sequence, a collection of vocal works both great and small, ancient and modern, will be much less well known. That makes this set welcome, as indeed does the restoration of Yvonne Astruc�s recordings of Lili Boulanger, Nadia�s sister. With Jean Françaix playing his own Concerto we therefore have a span of recordings made between the years 1930 and 1949. The vocal ensemble included some now richly evocative names � Comtesse de Polignac, Hugues Cuenod, Doda Conrad and Paul Derenne amongst them. There was a small instrumental ensemble under Boulanger�s direction, Cuenod is himself featured in another of Cacavelle�s reissue series and his work in the rediscovery of Couperin is explored there. He was no less active in the cause of Monteverdi. The prevailing ethos is naturally romantic � warm basses, a piano continuo, and a sense of refined intensity in Hor che�l Ciel e la Terra. The little instrumental ensemble makes its presence felt in the spirited contribution to Chiome d�oro in which Derenne and Cuenod both show their richly characterised musical selves. For all that aspects of performance practice now sound anachronistic one should remember that these were amongst the earliest discographical propagandist works for Monteverdi and their warmth, energy, commitment and zeal � and the small matter of musical engagement � are still audible to this day. The Petit Concert sequence is rather a strange one in which Anonymous sits next to Debussy who rubs shoulders with Couperin, who brushes against Marcelle de Manziarly. One can enjoy the solemnity of Gisèle Peyron�s singing of Lili Boulanger�s Pie Jesu, as much as the scrunchy harmonies evoked in Leo Preger�s three-minute Cantique. The adjacent placement of the anonymous twelfth century S�on me regarde comes as a boisterous shock but that�s part of the incidental pleasures of this set. They are all short and pithy pieces �one or two of the sides are a touch scuffy. The Brahms Liebesliederwalzer were recorded a decade before the famous 1947 Vienna HMV recording. In Paris the vocal ensemble comprised De Polignac, Kedroff, Derenne and Conrad and at the piano were Lipatti and Boulanger. These are full of individual, sometimes even idiosyncratic touches especially from the two-piano team, but the buoyancy and lightness are infectious; it�s fleeter by some way than the Viennese performance though a little more cavalier as to note values and matters of rhythm and pronunciation. Hugely enjoyable though as are the remainder of the Brahms and Schubert sides. Boulanger also directs Françaix�s waggish and delightful concerto with its Chopinesque moments writ large and the composer on delicious form at the keyboard � though the orchestra sounds rather understaffed. And what a delight to hear again Lili Boulanger�s very Debussyan Nocturne in this idiomatic recording by Yvonne Astruc and Nadia Boulanger. The notes are minimal, as they seem to be throughout this reissue series. But recording details are full. Some of the transfers are rather scratchy but at their best they�re fine. A very worthwhile retrieval.